Brad Townsend has won Sprue Posse Open #5 by piloting his Logan-wing Space Wolves list to victory with a 3-0-1 record. Brad defeated Orks, Chaos Space Marines, and Crimson Fists on his way to the finals and then played reigning champion Jon Regul's Kan Wall list to a draw in the last round of Swiss to secure his tournament win and a trip to the Sprue Posse Invitational in December. Congratulation to Brad Townsend and all the finalists for Sprue Posse Open #5! Update: Army lists and photos for this event are available here. 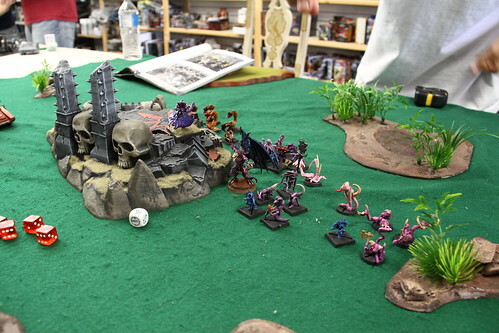 0 Response to "Playing: Sprue Posse Open #5: Live Blog Round Results"
Running a Sprue Posse Open tournament: A How-to.